Garcia is back onstage twenty minutes before the end of the break, infected by the sheer nervous energy that is the Grateful Dead at the corner of 7th Avenue and 33rd Street, the innermost circle of performance rock and roll, the Dead’s home away from home even though it is an antipodal mirror for this bunch of San Franciscans. It is a Monday night in late September, and Ram Rod has a TV perched on his road case with the 49ers game on. Garcia stops to watch. He’s not really a sports fan, and once said that he’s serious about the 49ers only when they’re winning because “I don’t need the additional heartache, you know what I mean?” The band gathers attentively as Joe Montana takes the team down the field until a bomb to Jerry Rice seals the game. This is the city Garcia fled immediately on his first visit, the place where Weir was mugged on his, where the animal energy of youth is most obvious, and where the band responds. Media and comedy routines be damned, it is time to do a show. Lights down and the crowd’s visceral roar snaps everything into focus as the band launches into “Cold Rain and Snow,” the tune Ken Frankel had taught Garcia in 1962, plaintive banjo picking transformed into powerful rock chords. Out front at the sound mixer Healy is bopping; the Garden rings like chimes as Garcia mournfully declaims, “Well I married me a wife, she’s been trouble all my life, run me out in the cold rain and snow.” The music is thick, rich. “Cold Rain” ends with a satisfying final chord that falls gently into a transition, something akin to watching a ten-ton truck turn on a dime. The first song is not yet over as a new up-tempo rhythm is established, and Garcia begins to sing Hunter’s lullaby to the child in all of us, “Franklin’s Tower.” “In another time’s forgotten space / your eyes looked through your mother’s face.” They dig in, reach deep. Garcia and Weir knit gentle riffs together while Lesh plays a counterlead over the quiet moments. Garcia’s lead picks up the stage and shakes it, kicking the moment from 70 to 120 decibels, then goes berserk, playing the melody backward, down in descending scale, strumming it up and then strumming it down, till all six musicians fuse in perfect proportion, all responsive and individual. It is still the melody and yet so much more, molten creation, conversation and dance. The tune levels off to a quiet shuffle, the cymbals whisper dippity dippity shush shush shush, the twelve-armed being picks gently into the sweet refrain yet again, slowly, exploring the figures to the point of hypnosis. The pulse is so right that it almost seems the music is perpetual, always out there somewhere, wanting only the right catalyst to be audible. Down the road a week to Boston, and it is celebrity time. As the band prepares to cast into the improvisational void, the essential purpose of the second set, the stage holds the tallest Dead Head, former NBA star Bill Walton, and his friends from the Boston Celtics, Larry Bird and Kevin McHale, Vic Firth, the first tympanist of the Boston Symphony Orchestra, and Richard Alpert, aka Baba Ram Dass. It is an interesting range of fans. But I know it come out right. . .
Lord, a man is just a man. . .
Just to look to see the sights . . . The second verse ends and they go into their first instrumental break. Gracefully focused, Mydland shifts ninety degrees on his bench and elegantly reaches to the synthesizer. He is such an addition to the band, in so difficult a role, still the new kid after nine years, and sometimes it hurts. Once Scrib had remarked to him on a flight between gigs, “Pretty moon,” and he replied, “It looks nicer at home.” Now Garcia focuses on Mydland, stroking him with his eyes, and the music lifts. Lesh’s face vibrates in different planes of joy. Garcia reaches down and twice fiddles with a pedal as lights wrap the band in purple haze with green pools all over the stage behind them. The melody line wanders, builds, becomes thunder, an atonal storm diversion, then pulses faster, thicker, a musical Mobius strip, a line that twists, shimmers, dances around six separate lines within it, musical DNA chains with color and texture, chains that harmonize and clash, unite and scatter. Images, ideas, entire worlds appear, collapse, return to a fused, perfect unity. This is the very definition of an ensemble sound. The room is full of music to the point of absolute density, a Jackson Pollock painting in notes. “When the Dead are playing their best,” wrote Hunter, “blood drips from the ceiling in great, rich drops. Together we do a kind of suicide in music which requires from each of us just enough information short of dropping the body to inquire into those spaces from which come our questions … about how living might occur in the shadow of certain death; and that death is satisfactory or unsatisfactory according to how we’ve lived and what we yield … Satisfaction in itself is nothing to be sought, it’s simply an excretion of the acceptance of responsibility.” Swept by the trance state of free improvisation over a never-lost pulse, one actually thinks in those terms. The future is here. “Suddenly the music is not notes or a tune,” wrote Michael Lydon in 1969, “but what those seven people are exactly:…an aural holograph of the GD. All their fibres, nuances, histories, desires, beings are clear.” It is, in T. S. Eliot’s words, “Music heard so deeply/ That it is not heard at all, but you are / the music / While the music lasts.” This is Dionysus in the late twentieth century, kin to William Blake, a transcendental art better experienced than described. Bent notes are scattered and tossed, all seems aimless, drums crash, Lesh sinks into lower and lower rumbling chords, the music slows, becomes giant boulders, high on the arid arm of a mountain . . .
Scrib has gone up behind the drums and stands talking with Ram Rod, who has his back to Hart. Scrib vaguely notices a sound that is not quite right, but by the time he opens his mouth to remark on it, Ram Rod has turned, checked, and gone to recover a stick Hart has dropped — an exquisite awareness, normal for the crew. As Ram Rod goes around him on the way back, Scrib murmurs, “Sorry.” “Why?” “‘Cause I’m in the way.” Smirking, Rod replies, “That might be your opinion.” It is one of the good nights. Kidd goes up and takes over the monitor board from Harry, and the elevated group mood is clear. 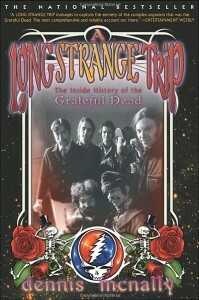 Comes the fourth verse, where a silver mine becomes a beggar’s tomb, and the musicians can only wonder, self-deprecatory to the last, “How does the song go?” And off the precipice, the drums tap fast on high hats and Lesh, Weir, and Mydland take a three-note riff out of the main chord and begin to repeat it endlessly, each instrument’s notes varying yet blending flawlessly into the main melody line, while Garcia’s lead races up and down mountains, the driving woof against a luxuriant warp. Deep in the last break his guitar makes an ancient, hollow sound, somehow medieval…then broadens to rock and roll strums. Scowling in concentration, Garcia peers over his glasses at a point approximately six inches in front of his nose. “He looks like an Old Testament prophet,” says Scrib to Mountain Girl. “More like Geppetto to me,” she responds. Anything can happen. On another night, perhaps they could stage one of their famous musical arguments about which song to play and change their (group) mind three times in as many bars of music. But tonight their decision-making, as well as their playing, is in perfect unity, with perfect rhythm, so that every riff has an overwhelming power, chords stacked like mighty walls, energy exactly expressed, synchronization, not synchronicity, although they can be contiguous. The jam out of the song trails quietly away, and the guitarists and Mydland leave the stage to the drummers.